Investor services firm Broadridge successfully executed a blockchain pilot focused on proxy voting this week, in partnership with JP Morgan, Northern Trust and Banco Santander. In a statement, Broadridge revealed that a private ethereum blockchain was used as a backup system to more traditional voting software, and that the test was conducted at an annual meeting at Santander Investments. A fruition of past statements about Broadridge's impending work, the test sought to showcase how blockchain could improve the transparency of proxy voting, the process by which shareholders cast votes at annual meetings. The solution seeks to provide an example for how a client could use a distributed ledger to gain daily insight into vote progress. Broadridge touted the solution as being able to give data access to a limited number of people, while using smart contracts to ensure transparency. In statements, Banco Santander lauded the test as a validation that blockchains could provide benefits for the voting use case. Likewise, Broadridge said it would increase the quality and efficiency of the proxy voting process. "The success of this pilot program reflects Broadridge's unique ability to leverage our domain expertise and deliver blockchain innovation to all industry participants." 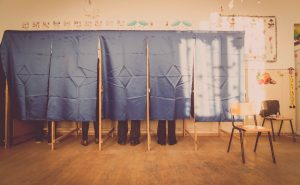 Notably, this is not the first time blockchain technology has been used to conduct proxy voting. Earlier this year, Nasdaq announced a project with Estonia's e-Residency platform using blockchains for proxy voting. The project was initiated in 2015 with the blockchain startup Chain.